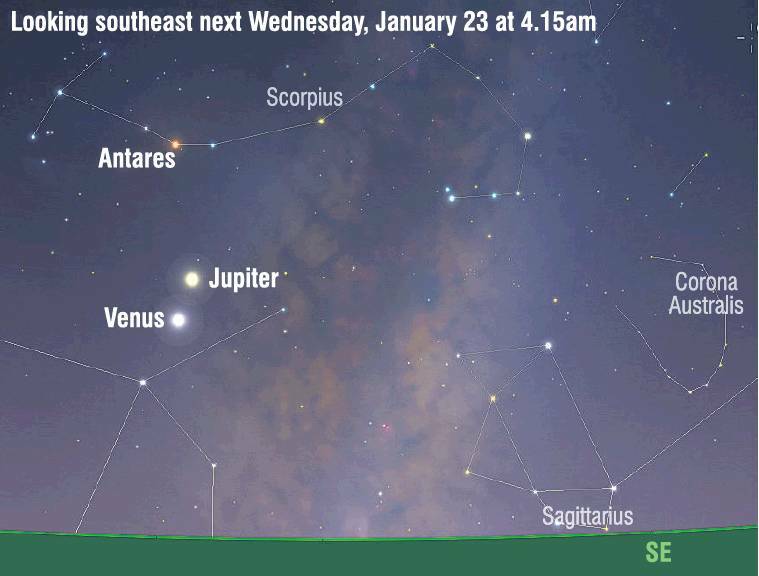 Stargazers are in for a treat next week - but you'll have to be up early, writes Ian Griffin. I want to invite you to cancel any plans you may have and get up very early on Wednesday morning (January 23). That's because something truly awe-inspiring will be visible to early-rising stargazers across our region and I'm sure once you hear about it you really won't want to miss out. I'm talking about a planetary conjunction, which is the complicated name astronomers give to a close approach between planets in the sky. But this will be when the two brightest planets visible to the naked eye, Venus and Jupiter, will be within three degrees of each other. In practice that means they will appear so close that the distance between them will be less than your three middle fingers held at arm's-length. I am genuinely excited by the prospect of seeing this planetary close approach, and will be finding a spot somewhere near the coast to ensure I can enjoy the event from the moment the planetary pairing rises above the skyline. In Dunedin, Jupiter should clear the horizon just before 2.45am, while the much brighter Venus will become visible shortly after 3am. If the sky is clear, the brace of rising planets should be a spectacular sight, with Jupiter's yellow colour contrasting beautifully with the blue-white Venus. Of course, while the planets appear close in the sky, they are, in fact, at very different distances from Earth, and the conjunction is just a line-of-sight effect. In fact, Venus will be a mere 120 million km from Earth next Wednesday, whereas Jupiter will be over 890 million km away. In what, I am sure, will be a disappointment to any watching astrologers, the planets are both in the constellation Ophiuchus (the serpent-bearer); this is a large sprawling constellation which spans the Zodiac as defined by astronomers but which is not recognised by astrological soothsayers. With sunrise occurring at 5.45am, the best time to view the conjunction of the planets, higher above the horizon with a dark background sky, will be prior to 4.45am. After that time the sky will be too bright to fully enjoy the vista.